Dale Farm: Are We Missing The Point Here? The issue of the travellers camp at Dale Farm in Essex has been poked, prodded, manipulated and wrung dry of pathos by the media. But as we continue to wade through confusing stories of helpless cancer stricken pensioners being hurled out onto the street and non-resident protester types infiltrating the site in order to wage battle against the authorities, have we lost sight of the point? If we are all going to live on this happy little island, the first thing we’re going to have to get over is ourselves. In order to enjoy the benefits of a safe, secure society such as clean, fresh water, waste disposal systems (it doesn’t matter how you dress it up, cholera is not a good look on anyone) and hospital care for the sick and welfare for the genuinely needy, everyone has to co-operate. Turning every issue into an ‘us vs. them’ situation might be great for the press but it resolves nothing. The bailiffs are going in to Dale Farm to evict residents from an area of the land that they are living on without planning consent. The travellers are, for the most part, without public sympathy. If you disregard the unhelpful accusations of racism being hurled at people agreeing with the council’s stance, the fact of the matter is that people are basically peeved that the matter has been dragging on for ten years and has cost £18m to date, plus the fact that the only experience the wider population has of travellers is the mess they leave behind them. But those looking down disapprovingly on all this from their three-bedroom semis are no better. By buying in to the media driven cries of ‘nanny state’ every time the government attempts to implement a health and safety measure or changes in NHS policy, smoking, drinking, food or drug legislation, they are collectively eroding any power that government has and simultaneously binding us more tightly in bureaucratic red tape. 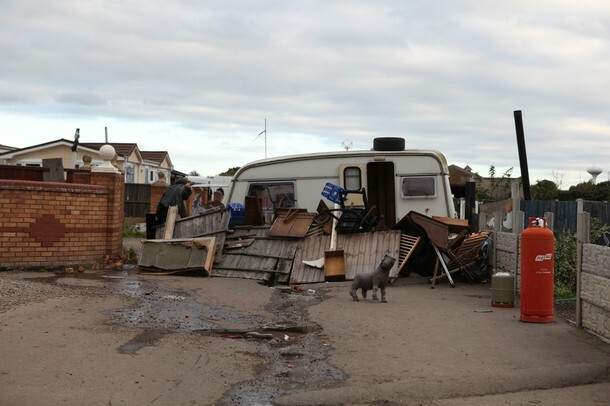 It shouldn’t have to be said in 2011, but people should have the right to live how they want to, whether it be in a gated community or a twenty-year old caravan on an old scrap yard. Neither one is right or wrong, they’re merely different. But whatever we’re doing we should take responsibility for ourselves. Don’t break planning laws. Parking laws. Fly tipping laws. Then maybe Westminster could concentrate on other, more important matters. Like making space to ensure everyone has a safe, clean and comfortable place to live. If they’re not too busy fiddling their expenses, of course.